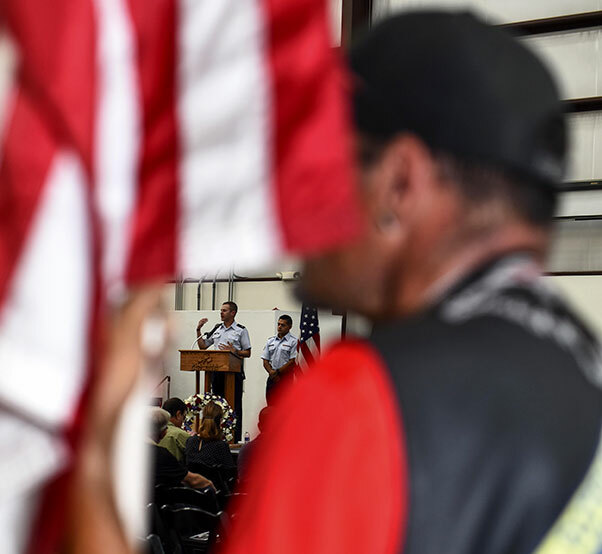 Pima Air and Space Museum, Ariz.
Former World War II POW, Walter Ram, gives a speech during a POW/MIA remembrance ceremony at the Pima Air and Space Museum in Tucson, Ariz., Sept. 15, 2017. Ram served in the U.S. Army Air Corps as a B-17E radio operator and gunner. 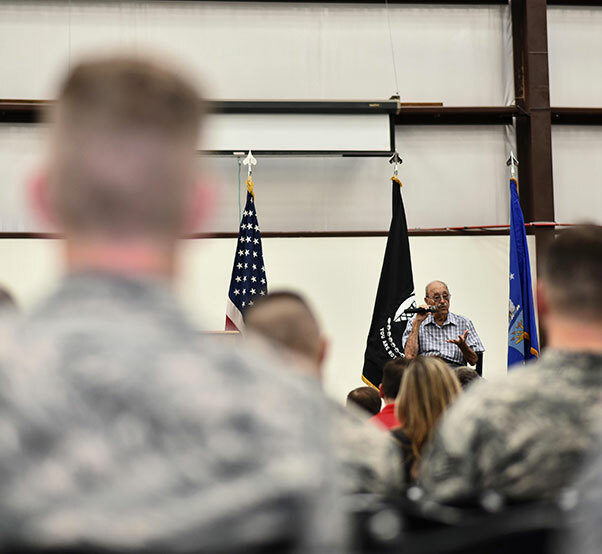 Davis-Monthan Air Force Base’s Desert Lightning Team hosted a ceremony in honor of U.S. prisoners of war and service members missing in action at the Pima Air and Space Museum in Tucson, Ariz., Sept. 15. 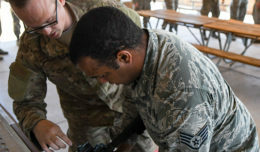 The ceremony was held in accordance with the 2017 National POW/MIA Recognition Day to honor U.S. prisoners of war, missing service members and their families. The event began with opening remarks from Col. Scott Campbell, 355th Fighter Wing commander. 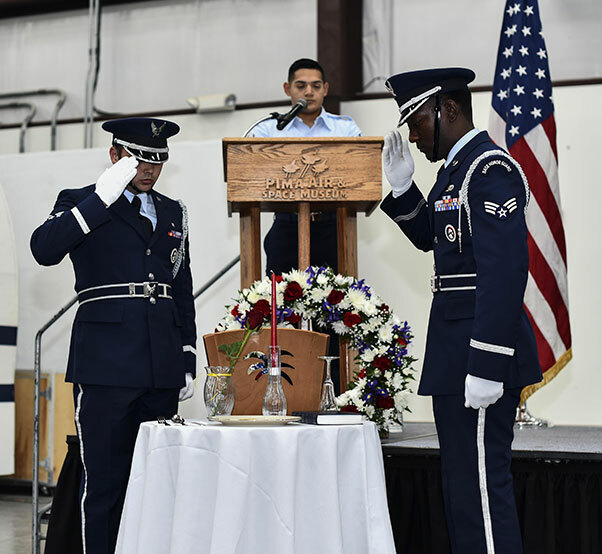 Davis-Monthan Air Force Base honor guardsmen render a salute to the Missing Man Table during a POW/MIA remembrance ceremony at the Pima Air and Space Museum in Tucson, Ariz., Sept. 15, 2017. The table cloth symbolizes the purity of their intentions, the rose for the families and loved ones who await their return, the red ribbon shows the determination to demand proper accounting for those missing, the lemon is symbolic of the bitterness they faced and the salt represents the tears of their loved ones. 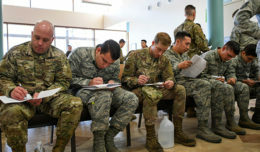 Finally, the inverted glass and empty chair show the service members are still missing. 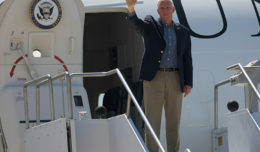 After the ceremony, former World War II Walter Ram, delivered a speech to the audience a speech about his experience as a POW. Ram enlisted into the U.S. Army Air Corps at the age of 16 and served as a B-17E radio operator and gunner for nearly five years. During his sixth bombing mission, Ram and the rest of his aircrew were shot down in Kiel, Germany, where he began his year and a half as a POW. 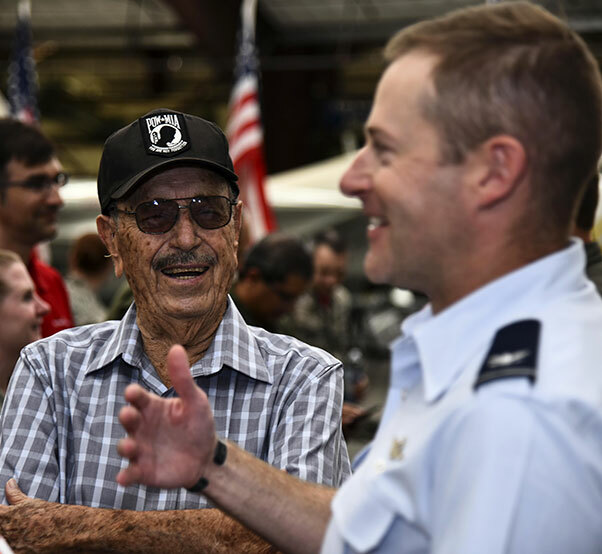 Former World War II POW, Walter Ram, and U.S. Air Force Col. Scott Campbell, 355th Fighter Wing commander, share a laugh before a POW/MIA remembrance ceremony at the Pima Air and Space Museum in Tucson, Ariz., Sept. 15, 2017. The ceremony was held in honor of POWs and those who are still MIA. After Germany’s decision to surrender and release its U.S. prisoners, Ram found himself on U.S. soil in New York City. The ceremony concluded with Campbell presenting Ram with a POW/MIA flag. 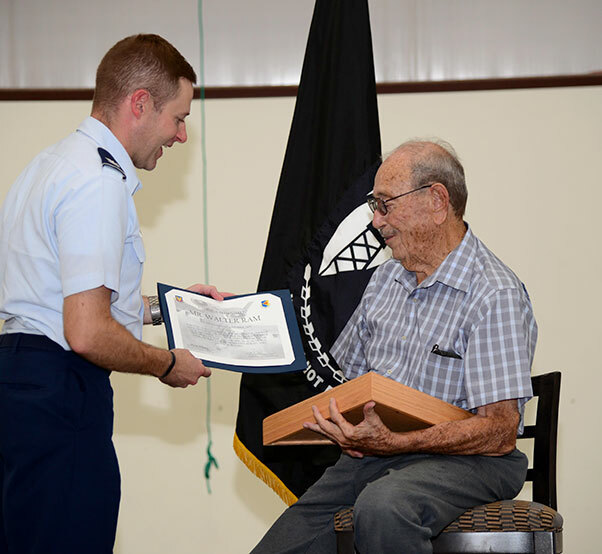 Col. Scott Campbell, 355th Fighter Wing commander, presents Walter Ram, former World War II POW, with a flag during a POW/MIA remembrance ceremony at the Pima Air and Space Museum in Tucson, Ariz., Sept. 15, 2017. The ceremony was on the 2017 National POW/MIA Recognition Day which is dedicated to honoring all past and present prisoners of war and those missing in action. Col. Scott Campbell, 355th Fighter Wing commander, speaks during a POW/MIA remembrance ceremony at the Pima Air and Space Museum in Tucson, Ariz., Sept. 15, 2017. The ceremony was held in honor of POWs and those who are still MIA. 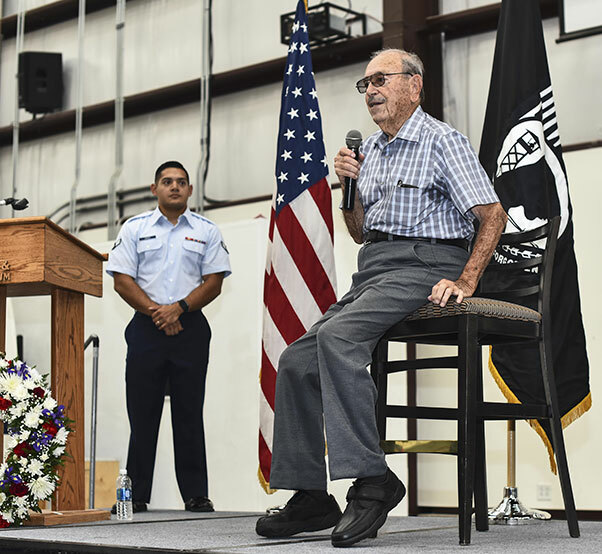 Former World War II POW, Walter Ram, gives a speech during a POW/MIA remembrance ceremony at the Pima Air and Space Museum in Tucson, Ariz., Sept. 15, 2017. The ceremony was held in honor of POWs and those who are still MIA.